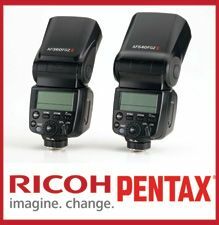 Denver, CO—Ricoh Imaging Americas Corporation launched the AF540FGZ II and AF360FGZ II flash units for Pentax-branded interchangeable-lens cameras, extending its portfolio of weather-sealed products. 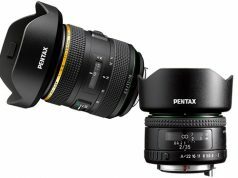 As the final component in Ricoh Imaging’s weather-sealed DSLR system, the AF540FGZ II and AF360FGZ II were designed with the active photographer in mind and feature significant upgrades, such as Pentax original weather-sealing (AW) technology and a new constant light source. 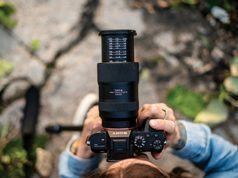 With 28 seals applied to crucial parts of the body, including the hot shoe, the flashes are engineered for highly dependable weather resistance. With guide numbers of 178 at ISO 100/ft. and 118 at ISO 100/ft, respectively, the AF540FGZ II and AF360FGZ II flashes provide a variety of advanced flash applications, including P-TTL auto flash, high-speed synchronization and wireless P-TTL auto flash. Additionally, both units feature a LED light to act as a constant light source for video and long-exposure photography. Also featured are recycle times of five seconds on the AF540FGZ II and two-and-a-half seconds on the AF360FGZ II; customized flash operation with the ability to preset nine flash functions, including the on/off of the catch-light function using the LED light and the choice of the flash discharge mode in still-image shooting; a bounce flash function, adjustable to angles of -10º to 90º vertically and 180º horizontally (new in the 360-series flash); power-zoom flash to cover angles of view from 24–85mm lenses (equivalent); a built-in wide-angle panel that slides out to cover a 20mm angle of view (in 35mm format); automatic setting of discharge angle in combination with a Pentax interchangeable-lens camera; and a multiflash emission function.